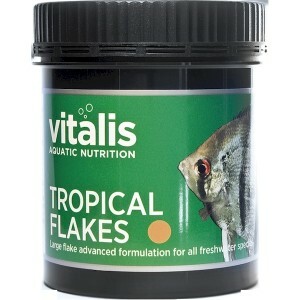 Vitalis Tropical flake is formulated usine only natural ingredients and preservatives which are blended with our unique mineral profile exclusively formulated by Vitalis, it provides a complete balanced diet for tropical freshwater species. Vitalis Tropical Flakes provide a rich source of high quality protein, lipids and natural carotenoid pigments and have been designed to ensure filter efficiency and optimum water quality. Fish and Fish Derivatives, Derivatives of Vegetable Origin, Algae, Oils and Fats, Molluscs and Crustaceans, Minerals. Protein 43.8%, Inorganic Matter 16%, Fat Content 7.5%, Fibre 2.2%..
Small and lightweight items (below 4kg) will normally be sent via Royal Mail 1st class, and will be delivered within 5 days, usually next day. Larger orders with a total weight over 4kg will normally be sent via parcel carrier for delivery the next working day.